We’re going to have a homelessness problem until we get serious about addressing the root causes from the start: poverty, racism, inadequate mental-health and substance-abuse care. Seattle is still trying to keep people from camping under bridges or in other public places, even though pushing people out of one spot means most will just find another outdoor place to sleep. All across the country, local governments have been trying to find solutions to the problem of homelessness with varying degrees of success, but no absolute solutions. Last week, Seattle cleared people from underneath a ramp leading to the Ballard Bridge in Ballard and fenced off the area to keep them from coming back. 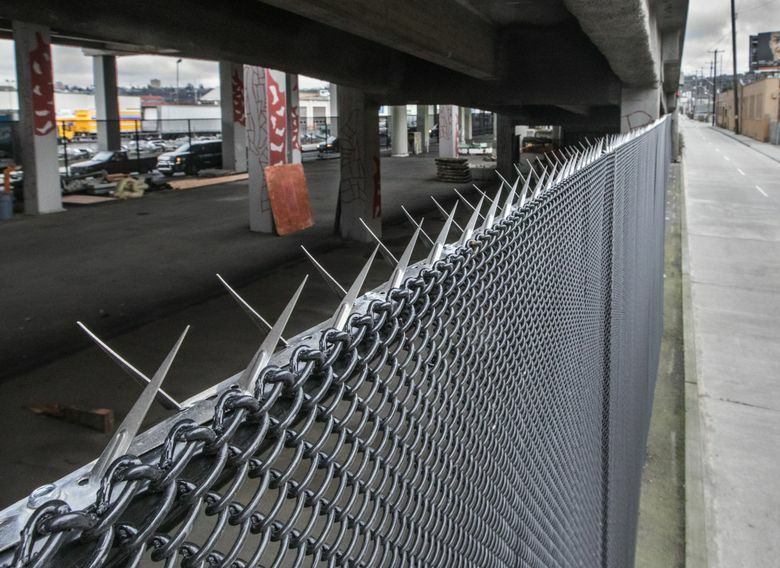 A story in The Seattle Times said the fencing would cost about $100,000, which prompted City Councilmember Mike O’Brien to say that, for that money, the people who had been camping there could have been placed in apartments for a year. He was right. There is also a case to be made that public safety is served by restricting encampments, but where is the humanity in that, or the utility, if people are just swept to another spot? The city has said it is committed to doing better than that, but so far it doesn’t have the capacity to meet the needs of every homeless person in Seattle. It’s both building fences and encampments. The city and King County continue to find ways to get more people off the streets, but then more take their places. That isn’t because the area is attracting homeless people from other parts of the country who’ve heard how wonderful life is here for people on the streets. That absurd idea shows up constantly on comment threads about homelessness. Efforts to determine where local homeless people are from reveal most of them come from around here, and none of them sets out to be homeless. There are multiple underlying causes of homelessness, a complexity that makes it particularly resistant to any one solution. It can feel like an impossible problem, because it results from so many other issues. The way to deal with homelessness is to prevent most of it from happening to begin with and to address most of the rest by quickly providing housing and services that help people get back on track. If it were easy to do any of that, there would be no people sleeping on sidewalks or under bridges. It isn’t easy or cheap, so people keep becoming homeless while governments and social-service agencies use buckets to manage the flood. We won’t do better than that without first doing more to address some of the root causes. There are teenagers on the street because they ran away from abusive homes. There are families seeking shelter because a parent got sick and lost a job, or because the rent doubled suddenly and left them with no option. The most common reasons people cite for becoming homeless are lack of affordable housing, unemployment, poverty, mental illness and substance abuse and a lack of treatment. Homelessness is one of the indicators that society hasn’t dealt with those issues. Sometimes it’s just one of those problems that sends a person into homelessness, but too often it is a mutually reinforcing combination. Getting a person into housing for the long term has to include services that address whatever issues they face. But it would be better all around if we had easy access to effective mental-health care. If we did a better job of addressing poverty, homelessness could become a rare condition that did not absorb time and money while creating constant frustration. We need to recognize the humanity of everyone in our communities. It shouldn’t be a surprise that black Americans and Native Americans — people who face barriers to quality education and to good jobs — are hugely overrepresented among the homeless here and across the country. Our society needs to make some fundamental changes. Until then, we should use fewer limited resources to build fences and more on housing for the displaced.